Technology today is all Windows 8 and OS X Mountain Lion and Tablets and Retina Displays. So it's always fun to see someone paying tribute to the technology of old, just because. In this case, it's a brave soul who installed a 16-year-old verson of Mac OS 7 on a Nook Simple Touch, answering the question nobody asked: What would Mac OS have been like with a touchscreen? The eReader is running a version of Mini vMac that had been ported to Android, and was then hacked onto the device by members of the 68k Macintosh Liberation Army forums. 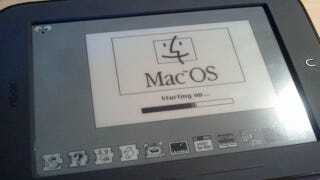 According to member FlyingToaster, both System 7 and 7.5 run on the device, though 7 is less crash prone. Also, the eInk screen suffers from a fair amount of ghosting, which should shock nobody. But yes, you can revisit staples such as the Flying Toasters screensavers, games like Super Munchers, and the ability to design your own desktop background in the system settings (the best part!). To top it off, FlyingToster posted a full gallery here.